Are boiler lockouts causing you grief? In our 5-minute guide, we’ll cover what a boiler lockout is, what happens during a lockout, and what to do next. Before we start, if you’re fed up of having an old unreliable boiler, you can get a fixed price online from BOXT. Being part owned by Bosch, this is about the best deal you’ll get on a Worcester Bosch boiler. What Is A Boiler Lockout? A boiler lockout is a shut-down procedure that is initiated when a boiler is not working within certain tolerances. This could be due to low/high water pressure, lack of or no fuel supply (gas, LPG or oil), a blockage in the system or lack of power to electronic components. What Happens During A Boiler Lockout? Expect to see either red or green flashing lights. The boiler will begin to shut down. Newer boilers with a display panel will display a fault code, which gives an indication of what the problem is. If your experiencing boiler lockouts for the first time, or intermittently, there’s a few things you can do. Alongside flashing lights on the display panel, you’ll notice a fault code. Take note of the fault code, and reference your owner’s manual to determine what the code means. Resetting your boiler at this stage will do nothing. You need to fix the problem before going any further. Try to match your fault code to one of the faults below. We’ve added a quick guideline of the fix needed to clear the fault code and prevent boiler lockouts. Pumps can blow seals, or seize. If your fault code relates to pump failures, or water circulation, read our article on fixing boiler pump problems. Check the ignition leads and probe. Most boilers lockout after 3 failed ignition attempts. Reference your owner’s manual to determine the pressure your boiler should operate at. 1.3 bar is normal, and most boilers will lockout if they are below 0.6 bar or above 3 bar. To increase pressure, add water via the boiler filling loop. To remove water pressure, bleed radiator valves with a bleed key. Having no power to a boiler, could be due to a failed display board, a blown fuse, or tripped electrics in your property. Especially in the mornings and winter, check your condensate pipe (it vents outside) isn’t frozen. Other common blockages come from heating sludge build up in radiators and pipework. If you’ve noticed a whistling noise coming from your boiler, there’s a good chance there’s limescale build up on the heat exchanger. It will need to be cleaned. This will lead to the water temperature getting too high, causing the boiler to lockout. Your boiler’s fan vents gases from your boiler, via the flue. If the fan isn’t working correctly, your boiler is going to be dangerous, and it’s going to lockout. Modern boilers will have a reset button on the display button. Press and hold the button to reset the boiler after a lockout. For older boilers (or boilers that don’t have a reset button on the front of the boiler) refer to the manual to determine the reset procedure. That all sounds good in theory. But, what if your boiler won’t reset after a lockout? Even when you’ve found and fixed the problem relating to the fault code? Unfortunately, a boiler’s computing power isn’t like a PC or laptop. It will try and determine the most relevant fault code. But, that doesn’t mean it’s correct, or the only fault with the system. So, you’ll need to run through some checks to determine if there are any other faults, before resetting again. Can you feel small vibrations and humming from the pump? This signals the motor is working. If it is, is it too hot to touch? A hot pump suggests seized internal parts. A gentle tap can sometimes free them. The pressure on your boiler should be 1.3-1.5 bar. If it’s not, this could cause a lockout. The PCB is the heart of a boiler. Is the display panel showing any lights or codes, or is it completely blank? A boiler will immediately lockout without a working PCB, as this unit communicates with all electrical components in the boiler (pump, fan etc) to work. Check the condition of the fuse. If the fuse hasn’t blown, try plugging in the boiler elsewhere. And of course, check your property’s electricity hasn’t tripped. There’s a flow and return water pipe on each boiler. One should be piping hot, the other slightly cooler. Flow is the hot water leaving the system, it travels around, and returns via the, well, return. Naturally, the water will lose some heat as it travels around radiators and pipes. If the flow is hot, but the return is cold, that’s a sign of a blockage. Most likely, it’s limescale and heating sludge that needs to be removed with a power flush. Thanks for reading out 5-minute guide to boiler lockouts. Still not fixed? Checkout our guide to boiler troubleshooting here. 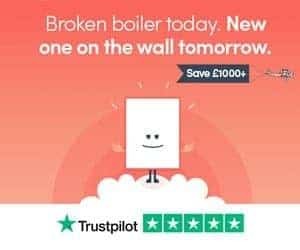 Fed up of your old boiler? Get a brand new Worcester Bosch boiler fitted as soon as tomorrow, from BOXT. Still have a boiler that is locking out, and have questions? Drop a comment below and we’ll get back to you as soon as possible.